Student Council elections are coming to a head at CAS Middle School in Douglas. Every school year, students have the opportunity to run for the office of President, Vice President, Secretary, Treasurer, Activity Chairperson, Community Chairperson, or Historian. Student Candidates will be presenting to the student body on August 19th, and students will be able to cast their votes the following day. The Student Council is responsible for school fundraising, as well as, organizing the school’s Halloween Dance and Valentine’s Day Dance. If elected, students must maintain good grades and behavior to remain on the council. CAS wishes all of the candidates good luck! CAS Middle School in Douglas held its final Academic Awards Ceremony on May 20th. The ceremony recognized students for earning straight A’s this school year. Students who had maintained a grade point average of 3.8 or higher since the fourth grade received the Presidential Academic Achievement Award. The ceremony was well attended by students’ families. 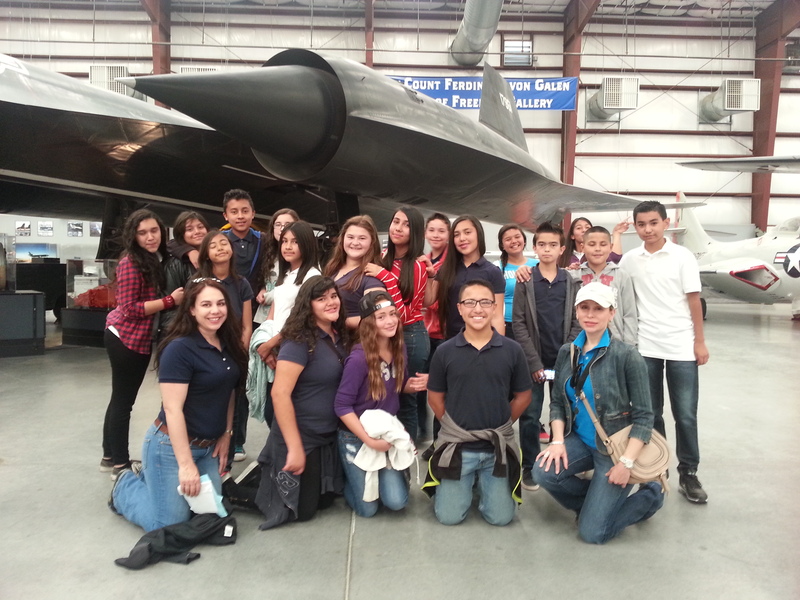 The students in Mrs. Gonzalez’s and Ms. Paredes’ 7th grade science class went on a field trip to the Pima Air and Space Museum. The students learned about the evolution of flight and were able to walk around and look at various types of airplanes. They saw planes that have been in various wars, as well as space. They also toured the Airplane Boneyard viewing hundreds of planes that were previously engaged in military efforts around the globe. 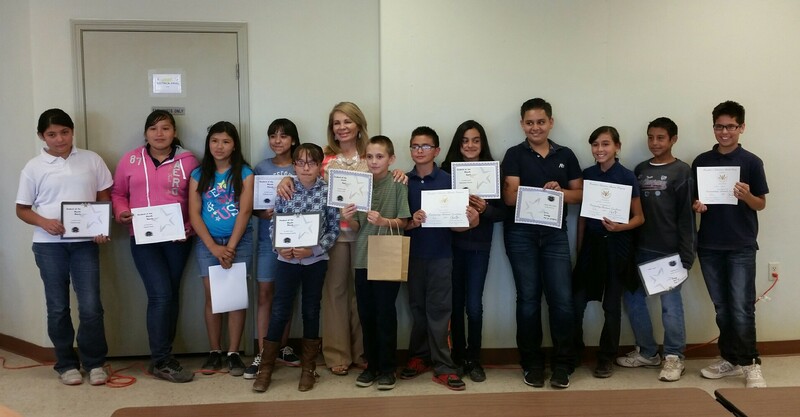 Recipients pose with Principal Munguia with their certificates. In keeping with its tradition of honoring excellence, CAS celebrated its January and February Student of the Month recipients with a morning ceremony on February 5th. 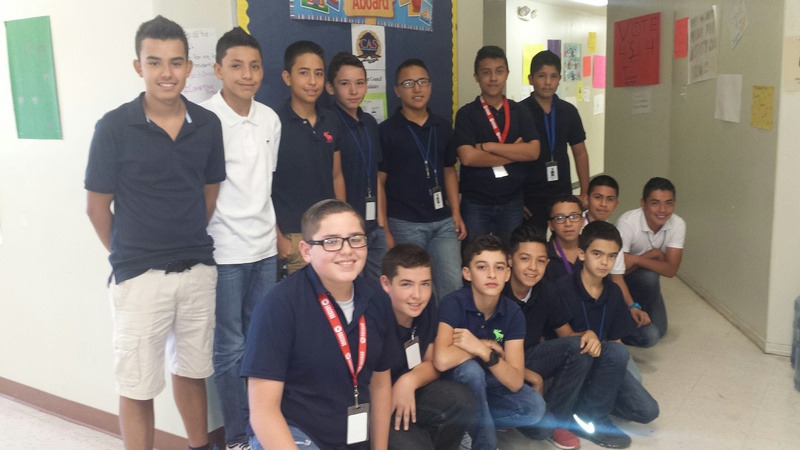 Teachers nominate and select students for this honor based on their character, scholastic achievements, and positive attitudes. Congratulations to all who received this recognition as they truly embody the spirit of CAS excellence. Students, teachers, and administration gathered in December to celebrate student success in perfect attendance and honor roll. Students were awarded in front of peers for their achievements in order to instill the value of hard work and character honor. Congratulations to all of our honored students; we can’t wait to see how far our students go in the new year. The Douglas campus will reopen after the winter break on Monday, January 5th, 2015. 8th Graders line up for promotion ceremony. 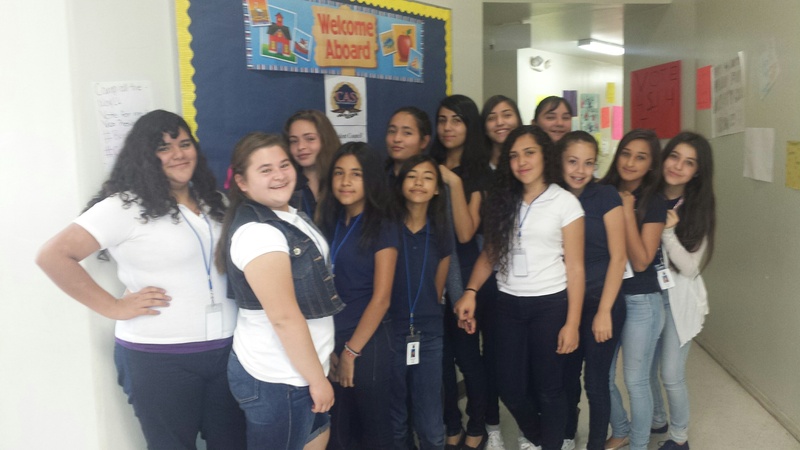 On May 30th, the Center for Academic Success Middle School in Douglas celebrated their 8th grade Promotion Ceremony. 48 middle school students received their promotion certificate from the school Principal, Marcela Munguia, while their parents and friends cheered and sang with them. The majority of the students have registered at CAS High School and are currently being assessed for placement in Math, Science and English. Balloons, cake, ice cream and soft drinks were provided for everyone compliments of the Middle School Student Counsel. Veda Phelps, Don Derrick, and Marcela Munguia (pictured center) preside over the ribbon cutting. On May 29th, CAS Middle School celebrated the opening of their new building at 1415 F. Ave with the traditional ribbon cutting ceremony as well as their annual Spring Fling. Douglas staff enjoy the spring fling. Dr. Don Derrick, district Superintendent, did the honors for the ribbon cutting while Executive director Vada Phelps was the master of ceremonies. The spring fling included fun and food for all as students, parents, and faculty celebrated the new building and their achievements that year. Principal Marcela Munguia stated that the building expansion which will now hold classroom space for over 450 students was “a dream come true”. 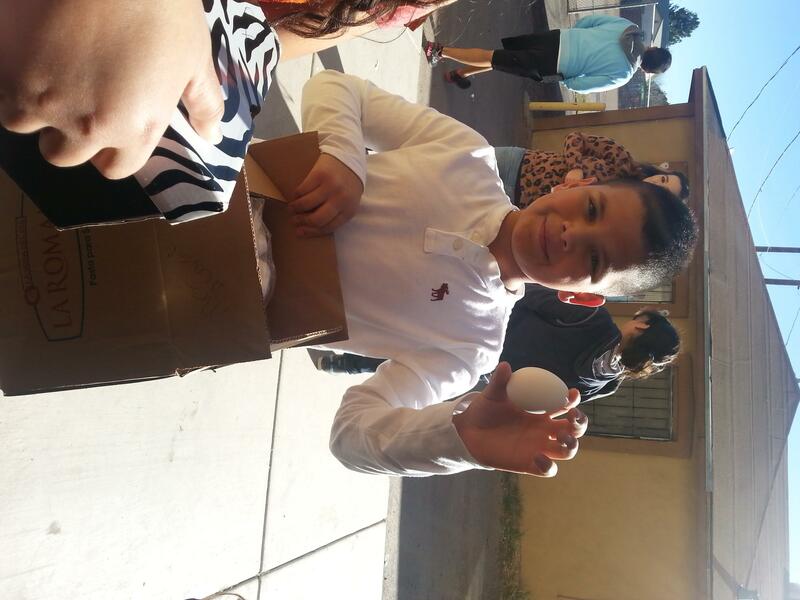 Principal Munguia evaluates a participant’s decor. The staff at the CAS Elementary building participated in the window/door Christmas decoration contest as a way of bringing some friendly competition into the season’s festivities. Teachers created themed classroom displays with which the students participated and helped place. Themes included gingerbread houses, snowmen, the Polar Express, Santa and reindeer, Elf on the Shelf, and other Christmas themes. The art work was later judged by Dr. Don Derrick, Superintendent and Marcela Munguia, Principal (pictured left). Elf decor brightens this classroom’s door. Awards will be handed out at the CAS Staff Christmas party on December 19th for most creative designs and best student involvement. All of the classrooms did an excellent job and everyone agreed that the whole building looked “happier” with the decorations. Christmas celebrations are just one of the many ways the Center for Academic Success helps students feel like their school is a second home to them. We wish all of our staff, students, and families a Merry Christmas and Happy New Year for 2014! The CAS Middle school Cafeteria construction phase is finished. New bathrooms and a large, new cafeteria are now available to our Fourth through Eighth grade students. All of the students that were attending school on First street have now been moved to the F. Ave building. The final phase, which includes 5 classrooms and 6 bathrooms will be finished by Thanksgiving. Thank you to all of our staff, students, and parents who have been patient with us throughout the construction in our building. We know that the hard work will be worth it as we strive to provide the best possible atmosphere for learning and fun.